The Lesser Velarb Jungle conceals many things, but most only know of the troglodytes and plethora of giant slugs and snails. The northern reaches of the jungle mix into the extensive swamps of the Black Mire, but as the land becomes drier to the south remains and ruins of networks of old Elsilian Empire canals can be found. While most of the Elsilian ruins have long ago sunk into the swamps and been absorbed by the jungle, two of the cities are still sought by adventurers. 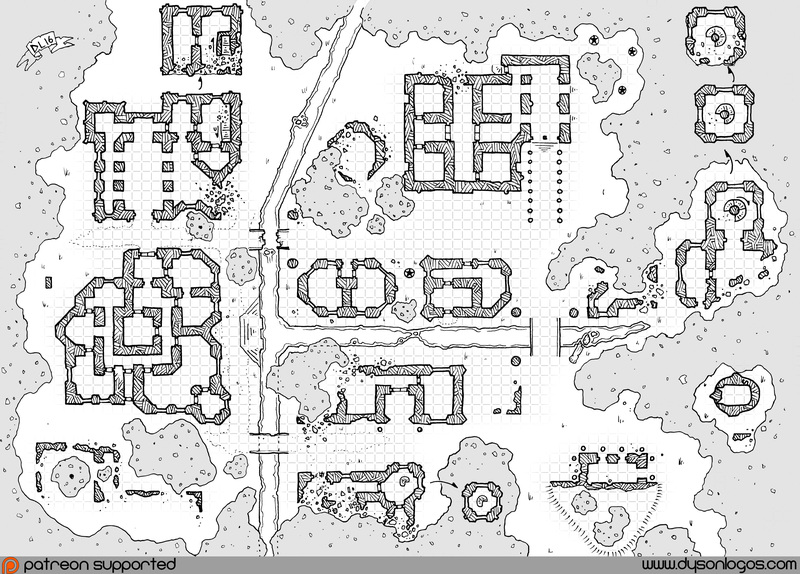 The ivory capital of Lukil Pamen is a fabled lost city of the realms, sought by many treasure hunters, but said to be concealed not just by the Lesser Velarb Jungle but by esoteric magics. But some of the ruins of the garden city of Pam Utel still remain. 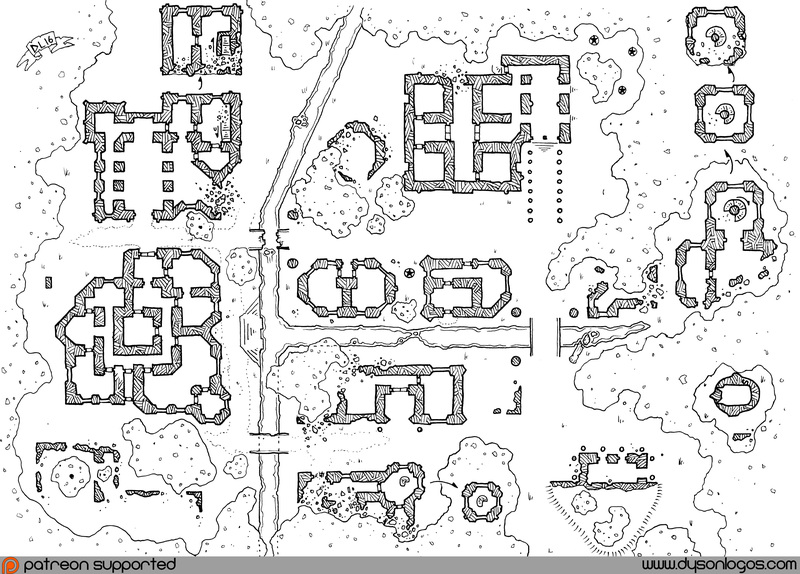 This map is of one of the better surviving neighbourhoods of Pam Utel. Around the area presented in this map are a number of ruined structures and canals in the jungle, none being much more than a couple of half-standing walls and wet ditches with stone banks. Multiple structures still stand in this neighbourhood and the jungle only partially encroaches upon it. Structures are a mix of old temples and businesses with a few sturdy residential structures along the east-west canal. Several of the structures have upper levels that are partially intact (indicated on the map with arrows connecting the upper levels to the lower levels – generally assume there’s nothing of interest in the areas on the map beneath these areas), and one interesting structure in the lower right side of the page is a massive sculpture of a human head with hair in a topknot wearing a coronet – this structure has a secret door behind the right ear into the interior of the head. If there would be any dungeons attached to these structures, they would most likely be beneath this giant head, or accessed through the temple in the upper centre of the map. However, any such dungeons would be mostly water and mud-filled because of the high water table and collapsing canals. These ruins were drawn based on a request from one of my patrons. I occasionally send out a request for ideas from my patrons who support my Patreon campaign at the $2.50 level and above, and this latest round of requests included a lot of great ideas that I’ll be trying to incorporate into maps over the next few months. This reminds me of the map of Untergard from the “Through The Drakwald” adventure in the Warhammer Fantasy Roleplay second edition rulebook. Very nice! I’ve picked this map for my party’s upcoming adventure, where they investigate a wizard conducting experiments into the Far Realm. This ruined town will house his ‘experiments’ and constructs used to keep the ‘test subjects’ in line. Plus, I’m going to overlay the whole thing with a fog effect similar to Stephen King’s “The Mist”. Because some of the experiments have gotten loose….